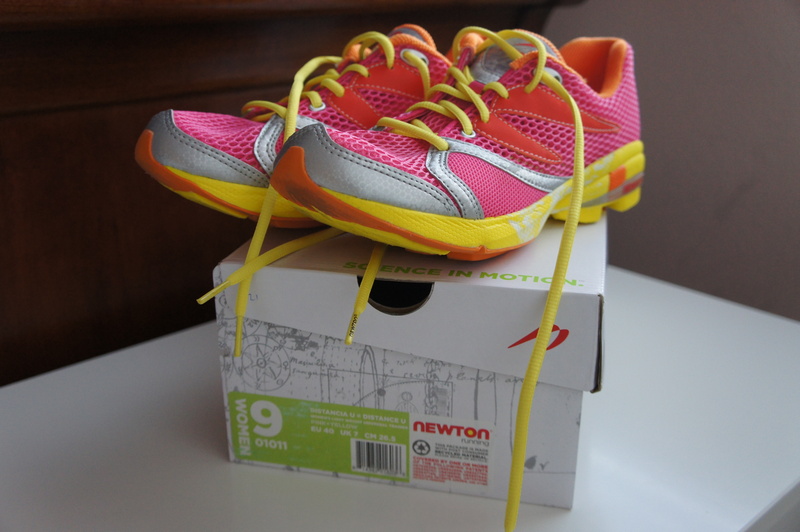 Newton Running is the mid-foot running shoe brand. 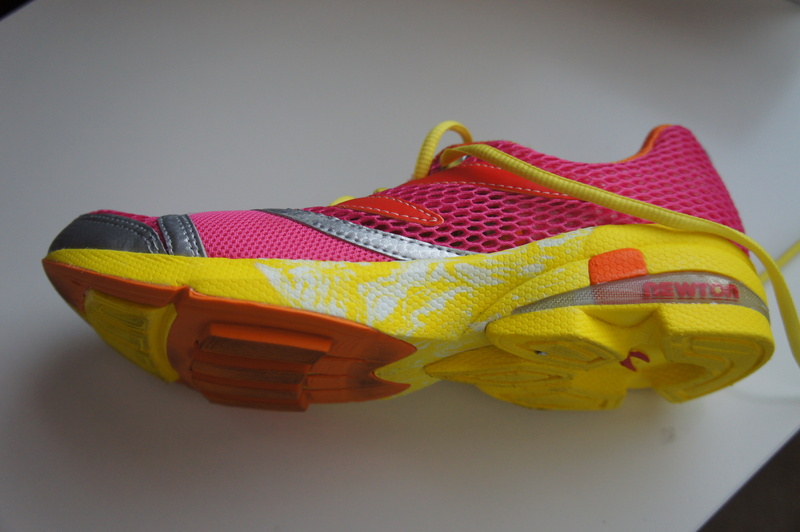 Their shoes mimic running barefoot by allowing your mid-foot/forefoot to strike the ground prior to your heel. To do this, the shoes have a protruding rubber bottom in the forefoot area. Why is this important? As I wrote about in my Running Injury Free post, mid-foot striking is our natural and most efficient running form because it protects our legs from the shock impact of running. I’d heard a lot of great feedback about Newton Running shoes and wanted to find a distance shoe that would allow me to mid-foot strike easily. I ran the Disney Marathon in Mizuno Inspires and found mid-foot striking difficult with the giant, chunky heel. However, my legs and feet aren’t strong enough to handle running for that long in my Vibrams. I chose the Distance model because it’s a light-weight, high-mileage trainer. My first impressions were that it was bright and light. If you are a fan of neutral looking shoes, Newton will not be the brand for you. They love them some color. I’ve run twice in the shoes so far and I have to say that I really love them. You see, I’m what I would call a paranoid runner. I focus on if my form is right. My typical running thoughts are something like, “Did I just land on my heel? I don’t want to land on my heel. Ugh, but if I correct myself it’s going to feel weird. Weird is better than being injured, Brenna! Do you want to be injured?” It’s an endless cycle I avoid in the Five Fingers and in the Newton Distance. I don’t have to worry about my gait. I know I’m landing correctly which allows me to think about other things– or hopefully zone out because let’s be honest, that’s the holy grail of running. I just picked up a pair of these. Haven’t had much of a chance to try them out yet, but am excited to. How have these held up so far? Did you find the more you ran in them, the better they got? They’ve held up really well. I would recommend transitioning into them slowly. I stupidly did a 10-miler my first week and developed some ankle pain. However, now they feel great! I also get compliments from strangers on the bright color. Let me know how you like them!